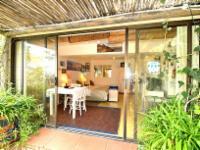 Campsbayglen is set in the trendy Camps Bay area; an upmarket area along the Atlantic Coast of Cape Town. It is situated on the edge of a little nature reserve and is unique and with its beautiful natural mountain river flowing right through the garden that attracting many birds. Accommodation is offered in three studios. These studios are comfortably furnished and surrounded by a natural garden setting overlooking a swimming pool. All units have private bathrooms, kitchens and living areas that lead out to verandas or patios. A Hammock Cabana overlaps the swimming pool so guests can lie around in the sun, have a traditional braai. Camps bay glen is very rustic. Could do with a revamp. Room was damp and not all that clean, especially the shower and bathroom. A nice setting but sadly the upkeep of the property was a little disappointing. Thanks Mark, we had a lovely time at Campsbayglen. It is very peaceful and relaxing. I also particularly liked the feeling that I was close to nature. Your staff members were very pleasant and efficient. I look forward to staying here again in the future. Many thanks. Ons is vriendelik ontvang. Ons het baie lekker gebly. Baie stil omgewing. Die huis is naby aan die nodige winkels en restuarante. Genoeg sekuriteit. Die diens was goed. We were a group with both children and adults. The children loved the place and went treasure hunting around the house. The adults found the view spectacular!! With some maintenance the place would be absolutely perfect!! Campsbayglen is 1.8km from the centre of Camps Bay , the nearest airport 24.7km (Cape Town International Airport). Collage of the pool, garden and river area.